At a very young age, Han Bennink started drumming for his grandparents on pans and cookie cans, and with curtain rods as sticks. All over the world, Bennink is celebrated as one of the most diverse, resourceful and playful drummers alive. He is especially known for his groundbreaking, improvisational shows: inventive and captivating for anyone present. As Jazzahead wrote about Han: "One of the most individual and stylistically open personalities of jazz of the past 40 years." At the age of 17, Han was confronted with a broken drum skin during his first performance abroad. His father’s advice: 'why don’t you just continue drumming on the floor?' Hence, a new world opened up for Bennink, and he discovered that the whole world could be used as a drum. During performances, Bennink seems to use everything he can get his hands on: from chairs and stands to his own body, he brings improvisation to a larger audience in a playful manner. This year, Han Bennink celebrates his 75th birthday. We thought it the right time to invite him as festival curator, so he can celebrate his birthday together with the musicians he’s friends with, and has a kinship with. Therefore, Han Bennink’s curated program consists of some of his favorite artists he has had the pleasure to work with in the past. In true Han Bennink style though, he couldn’t resist: he doesn’t only invite all of them, he wants to perform with as many of them as he can. After this first show, Han Bennink will engage in a sonic tête-à-tête with none other than Thurston Moore. Moore claimed fame as co-founder and singer/guitarist of Sonic Youth and continues to enrich the world with groundbreaking and revelatory music (the following night, Thurston Moore Group will also perform at TivoliVredenburg’s Ronda). On Friday, 10 November, there will be a true ‘Bennink-crawl’, starting at Museum Speelklok and leading you along Theater de Kikker, ending up in Kytopia. Museum Speelklok opens its door for a special one-off show. Hosting many types of automatically playing instruments, music boxes, and Dutch organs, it is a magical place. At the museum, pianist Nora Mulder will collaborate with multi-instrumentalist Mary Oliver: a master of the violin, viola and Hardanger fiddle, and a member of the ICP Orchestra. Vocalist for this performance will be Greetje Bijma. Then it’s off to Theater Kikker, where Bennink joins the stage with Alexander von Schlippenbach; founder of the well-known free jazz super-ensemble Globe Unity Orchestra as well as the Berlin Contemporary Jazz Orchestra. Next up is free-improv and jazz composer Steve Beresford, who often uses toy instruments and scores of TV shows to make for an entertaining show. Beresford collaborates with Gerard Bouwhuis, with an equal love for classical pieces as well as pop music and forward-thinking experimentation. Pairing these two musicians surely causes an exciting clash of styles. Our crawl leads you to Kytopia – indeed, formerly Tivoli Oudegracht, which has been Le Guess Who?’s main stage for years – for another Han Bennink collaboration. He will be joined on stage by sax player Omri Ziegele (founder of the unorthodox improv trio Noisy Minority) and Ernst Glerum, whose specialty is a unique, free-thinking take on the double-bass. All three artists are musical eccentrics, emphasizing spontaneity, brisk noise explorations while also having a good laugh along the way. There’s no stopping the energy here. Terrie Ex, who has many years of experience on stage with The Ex (last year's Le Guess Who? curators), collaborates with Spring Heel Jack. 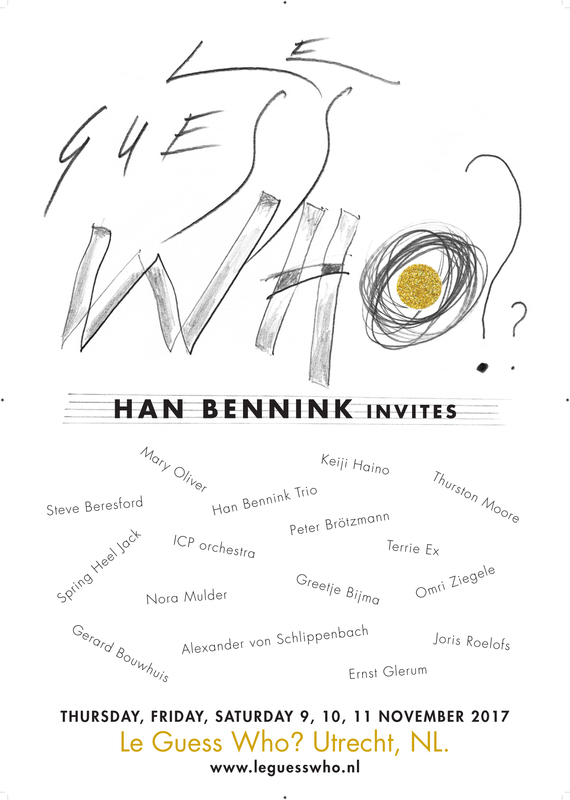 Both took part in a residency that Bennink held earlier this year, and apparently, it opened Han’s eyes and ears to connect the two for Le Guess Who?. To conclude this evening, Bennink couldn’t resist to take the stage once more with Award-winning Dutch composer, bass clarinet player, and saxophonist Joris Roelofs. Since forming an experimental duo together last year, the two have clearly found each other, and have collaborated multiple times since. Han Bennink’s curated program will go out with a bang on Saturday, 11 November. Not only Han celebrates his 75th Anniversary in 2017; it also marks 50 years of his ICP Orchestra, founded by Bennink together with pianist Misha Mengelberg and saxophonist Willem Breuker. It’s a free-jazz orchestra as well as a record label, connecting jazz to other genres. Moreover, ICP Orchestra provides an opportunity for young, upcoming jazz talents to join in and develop themselves; the same opportunity Han received from his father. Before the ICP Orchestra kicks off though, Bennink will perform with legendary free jazz saxophonist Peter Brötzmann. In 1968, the Peter Brötzmann Octet (featuring Bennink) released ‘Machine Gun’. No doubt this live collaboration will be equally overwhelming.